PrimalScript had a visual file comparison feature since 4.0. 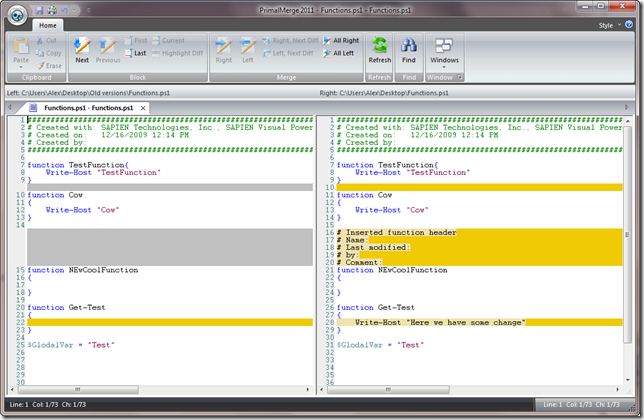 With the release of PrimalScript 2009 Studio we also added PrimalMerge, a tool to compare and merge not only files but also folders. While evaluating the feature line-up for our 2011 releases, we realized that comparing files in PrimalScript just so you have to then launch PrimalMerge, compare again and make the merge is a few steps too many. PrimalMerge 2011 will be part of PrimalScript 2011, PrimalForms 2011, PrimalXML 2011 and PrimalSQL 2011. It will no longer be available as a stand-alone product. PrimalMerge supports syntax coloring for PowerShell, VBScript, JScript and a number of other file types.